Dr Amanda Cohn is a locally trained medical doctor and a field volunteer with the Albury SES. She is passionate about keeping people well and out of hospital through a healthy environment and healthy community. 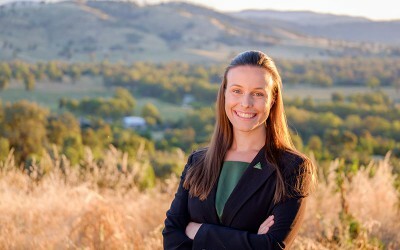 Amanda was the first Green and the youngest woman ever elected to AlburyCity Council. She was elected in 2016 standing for environmental sustainability and public health as top priorities in planning and development decisions, improving public and active transport, open and consultative local government and inclusion of diversity. Amanda has been a strong local advocate on climate change action, marriage equality, multiculturalism and rights to medical privacy around women’s health clinics. She is a conjoint associate lecturer at the UNSW Rural Medical School in Albury and is keen to keep doctors who train in the country working in the country. She is a founding member of the LGBTQIA+ Alliance Albury Wodonga and chair of the Albury-Wodonga Family and Domestic Violence Committee. She is also Council’s representative on the board of Parklands Albury-Wodonga. We need regular and reliable public transport services throughout Albury, including weekends and public holidays, so that all residents can fully participate in community life. Environmental sustainability and public health will be our top priorities in planning and development decisions. We live in a digital age where instant communication is part of our everyday lives. Council and councillors need to maximise use of modern technology to communicate with residents and businesses quickly and accessibly. Making sure local government policies and programs reflect the diversity of our community; including youth and the elderly, people with mental or physical disability, and those from diverse cultural, linguistic and religious backgrounds. The Albury Greens are a group of like minded Albury residents who share a set of common values. All decisions by a Greens councillor will be made on the basis of what’s best for the Albury community and our values, regardless of state party policy.